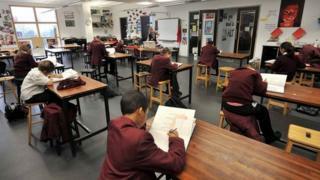 Low numbers of teachers being recruited in Wales is "bordering on crisis" levels, a union has said. Welsh Government figures showed the target for trainee teacher intake in secondary schools and for PGCEs had both been missed in 2015-16. Owen Hathway, Wales policy officer for the NUT, said the pressures and stresses of the job were putting people off entering the profession. The Welsh Government said it would be looking into the "downwards trend". The target for secondary school trainee intake was missed by a third while intake for primary schools was slightly below the target. For PGCEs it was missed by 19% (235 people). The government said, compared to overall graduate entry figures, teacher training recruitment remained strong and it was working closely with partners to identify and address issues. "We want teaching in Wales to be a first choice profession so we attract the very best," the spokesman said, adding new rules announced in spring are a key part of the drive. Mr Hathway said pressures in the job were putting people off - with figures obtained by the NUT showing nearly 50,000 teaching days were lost in Wales in 2016 due to stress. "People have seen the stresses and it's a real problem, causing ill health, and that does put people off going into teaching," he said. "They see pay freezes, pension cuts, pay cuts and teachers being asked to work for longer and the material benefits - although that's not generally why people go into teaching - are becoming less and less enticing. "They look at the work-life balance, and it's becoming less of an enticing profession." Mr Hathway added many teachers find the job was different to what they expected, and end up leaving. "The vast majority of people going into teaching do so because they want to empower a generation," he said. "But they get into the role and find they're so restricted in the job it doesn't actually benefit pupils and they become disillusioned and the pressures of the job beat the enthusiasm out of them. "Quite a few leave within the first five years because they've been worn down. "I'm not saying the teaching profession is in crisis right now, but it is bordering on a crisis." A former Rhondda Cynon Taff teacher said she left full-time teaching after just two years, aged 24, despite initially seeing it as a lifelong career. The woman, who did not wish to be named, said she was working 11-hour days to keep up with planning and marking, and worked through her weekends and holidays. "I'd try and give myself Friday night off but you spend most of Sunday doing more school work," she said. "Me and my flatmate were both teachers, we'd be sat on the sofa with our laptops because we felt too guilty and lazy to just watch TV so we'd do work as well." She became a supply teacher, thinking this may ease the pressure but left at 27 and found a job in a different profession. "Even with supply there comes planning, I didn't like to just turn up to a class, so I'd prepare sheets for classes ranging from reception to year six on a broad spectrum of subjects. "I felt too young to be tied down to that, I wasn't getting much of a social life. "The older teachers were depressed, half term and summer holidays are taken up with work, you can't fit marking and planning in otherwise." But she added she got a sense of satisfaction from teaching and continues to pay her fees and union membership in the hope of returning in future. "I felt awful for leaving, I still do. I feel like I let the pupils down. "But I needed time away from the classroom pressures, and you're living off a rubbish wage. "I would never tell someone not to teach. I loved and still love teaching, I love helping kids, I love seeing kids come out of their shells. "You can help shape their future, help them become individuals."